CT Coronary Angiography (CTCA) uses new state of the art CT technology that is able to image a beating heart. This non-invasive examination makes visualisation of the coronary vessels possible and provides very useful diagnostic information for patients who are considered at high risk for coronary artery disease. Risk factors for coronary artery disease (CAD) include smoking, hypertension, diabetes mellitus and a family history of CAD. CTCA examinations are available at our Subiaco, Mount Medical Centre, Midland Public Hospital, Murdoch and Shenton House, Joondalup locations. Why has my doctor referred me for a CTCA? From midnight before your examination you will be asked to withhold caffeine (eg coffee, tea and cola beverages). 2 hours before the procedure you will be asked to fast. Once you arrive at the clinic, you will be given a questionnaire to complete, which asks you to provide information about any medications you may be taking, any known allergies and any medical conditions you have. Please inform us if you are taking any diabetic medication, have kidney disease or have had a previous reaction to x-ray contrast. Please bring a list of all your current medications to your appointment. After completing any paperwork, your blood pressure and heart rate will be recorded by a nurse. You may be given a tablet called a beta-blocker. This is to slow your heart rate down to a level which is optimal for the scan. It usually takes an hour to achieve the required degree of heart rate slowing. You will be monitored by our nursing staff during this period. When the ideal heart rate is reached you will be taken into the CT room. During the procedure you will be lying on your back on the CT table. You will be connected to an ECG monitor for the duration of the examination. A small cannula with be placed in the vein in your arm. This is so the contrast medium or dye can be administered to enhance the vessels of the heart. Side effects from having a CT scan are very rare. During your procedure you will be exposed to a small amount of radiation. The benefits of detecting disease are believed to outweigh any potential risks from receiving such a small dose. At Perth Radiological Clinic, we have special protocols to ensure that radiation during the scan is kept to the minimum required to produce diagnostic quality images. The scan itself takes approximately 15 minutes. Most people can complete the test with 2-3 hours. Some however take 4. As we are not able to predict which patients will require the longer time we ask all patients to be prepared for this. 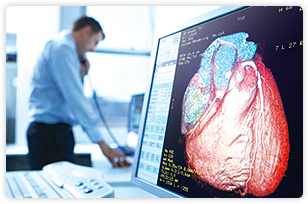 Your CT scan will be analysed and reported by a fully qualified and accredited specialist radiologist (a medical doctor with specialist training in diagnostic medical imaging and additional specialist training in cardiac imaging). The CT scanner generates a large number of images which need to be carefully analysed by the radiologist. The processing, reviewing and reporting of your CT images may take several hours. Additional time is required for typing the report, printing films and creating a CD of your images. Usually, the report is available to your referring doctor the next working day. Please notify the reception staff if you are going to wait for your films.